It took me about seven years and much head-scratching to complete this central feature of our earthbag house house. Some of the elements were in place for years, such as the large plastic stock watering tank that would serve as the tub. We still fondly remember climbing into a variety of such stock tanks at the agricultural supply store, to discover which size would accommodate us the best. Also, our yard had sported a pile of used solar water heating panels for many years, waiting for this project’s completion. One reason that I had procrastinated in building the hot tub/fountain was that I really wasn’t sure how I was going to make it work. I figured that I would need some sort of heat exchanger to transfer heat produced by the panels to the water in the tub. 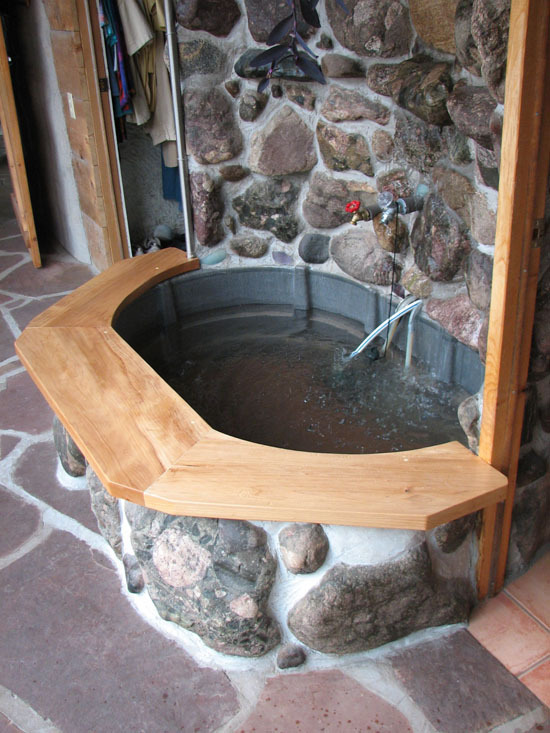 I was imagining a big coil of copper pipe that would be immersed in the water for this purpose, but what to do with this coil when we wanted to get in the tub? A rather cumbersome proposition! Then it suddenly dawned on me in the wee hours of the night (when I often do some of my best thinking) that I could create a mini radiant floor heater in the bottom of the tub. If I tightly coiled some of the common PEX tubing in the basin, and fixed it in place by wiring it to some 2″X2″ wire mesh, this whole arrangement could be embedded in a concrete pad that would serve to transfer the heat to the water above. This concept was definitely experimental, but it seemed worth trying. Another advantage of doing this is that the extra height of this heater pad would bring the level of the bottom of the tank up to where the drain pipe was located, so it would be much easier to drain the water from the tub. With the four large (3’X8′) solar water heating panels, I knew that there would be plenty of heating capacity to heat more than just the water in the hot tub, so I was also scheming to provide domestic hot water as well. For this I had scavenged an old 40 gallon electric hot water tank from the local dump and stripped it of everything but the basic metal tank. Again, I had the problem of how to transfer the heat from the solar panels to the water in this tank. This time, I took some of the same half-inch PEX tubing and coiled it around the outside of the tank, forcing it to stay in this position by also wrapping the coiled tubing with some 2″X2″ wire mesh. Then I installed this horizontally in a wooden box lined with rigid insulation and plastic, so that I could pour concrete to surround the entire affair. My idea was that the concrete would get hot from the PEX tubing, and then radiate this heat into the water in the tank. Hot water from this tank would then flow directly into the gas water heater so that it would seldom switch on. Controlling all of these features has taken some careful monitoring and further experimentation. I soon realized that the four solar water panels could actually provide more heat than necessary, especially on warm days, so I needed some way to deal with this. You can’t just turn off the pump on closed-loop system like this, because the glycol would eventually boil away. My solution was to make a rolling shade cloth curtain that I could easily lower over the panels themselves to control how much sun they got. This has worked well to fine tune exactly how much heat is introduced into the system, or to completely shut it down if necessary. With a few hundred dollars in parts and some ingenuity I have created a system that should provide pleasure, heat, humidity, and ambiance for many years to come, and all completely powered by the sun! Beautiful! 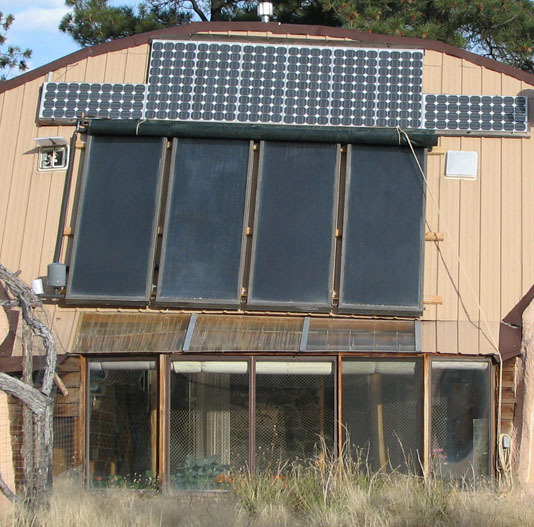 We are definitely planning on a hot tub in our earthship-inspired tire bale house… probably in the greenhouse. Thanks so much for keeping this inspirational blog going; it not only gives us a ton of very useful information, but helps during these long months of waiting before we can retire, move 1000 miles away, and finally start digging in! another way to generate hot water is to place 100m of 15mm water pipe in a huge compost pile.